A boy sits beside the pit where scores of miners were feared dead when the roof of an illegal gold mine collapsed at Dunkwa on-Offin in central Ghana, June 27, 2010. 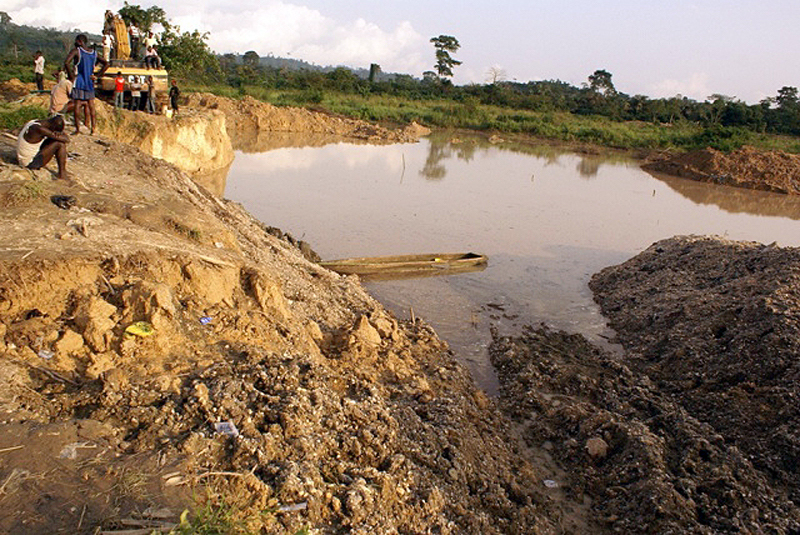 In June 2013, Ghana’s government sent a task force of soldiers, police, and immigration officers into Ghana’s gold country to root out illegal foreign miners, including some Chinese. One of the many simple, widely-believed narratives about the Chinese in Africa is that Chinese businesses fuel corruption across the continent. Chinese corporate corruption in Africa is well documented, from allegations of paying off corrupt officials in the Republic of the Congo to illegally logging protected rain forests. Then there is the man known as Sam Pa. Although few people know his actual identity, what is known, according to Financial Times correspondent Tom Burgis, who documented much of this man’s notorious history in Africa in the 2015 book The Looting Machine, is that billions of dollars flowed through his network as part of shady operations throughout Africa to secure oil drilling rights, mining deals, and countless other Sino-African business arrangements. Pa was so notorious for fueling corruption that the scope and scale of his allegedly illegal dealings in Africa seemingly became an issue for Chinese authorities in Beijing. Pa was detained in Beijing in October 2015 on corruption charges, swept up as part of Chinese President Xi Jinping’s vast anti-corruption crackdown. The case of Sam Pa and the billions allegedly doled out by Chinese corporations in places like the Republic of the Congo exemplify the kind of corruption that many people associate with the Chinese presence in Africa. However, that is only part of the story. While some major Chinese corporations have been linked to these kinds of illegal activities, smaller Chinese businesses throughout the continent often operate on the other end of the spectrum as victims of corruption. Zander Rounds, Research Manager at China House Kenya in Nairobi, has recently been conducting research on the role that small-to-medium sized Chinese enterprises play in Kenyan corruption. Zander conducted interviews with 25 Chinese business leaders in Kenya over a 10-month period, and what he learned over the course of his research is that as new immigrants in a country where they are forced to operate in an unfamiliar culture, language, and legal system, Chinese business owners are easy targets for bribes. Rounds’ research complicates the narrative that Chinese businesses are typically the instigators of corruption in Africa. He joins Eric and Cobus to discuss his findings and also to explore what, if anything, can be done to help correct the problem in Kenya.